ARLINGTON, VA and NEW YORK, NY, April 30, 2015 – The PBS KIDS digital series OH NOAH! (pbskids.org/noah) is expanding its offerings with new animated videos and games that introduce Spanish in an entertaining way. Launching today – a day to honor and celebrate children known as “El Día de los Niños” – new OH NOAH! content includes an immersive language learning game, “Lost and Found,” and a new 11-minute video, “Making a Splash.” In addition, all OH NOAH! content is now accessible on mobile and tablet devices via pbskids.org/noah. Geared to kids ages 4-7, OH NOAH! features the comic misadventures of Noah, a young boy staying with his grandmother in a community where almost no one else speaks English. As he tries to learn Spanish and makes new friends, misunderstandings land him in wacky predicaments, but he always manages to rebound and cheerfully learn from his mistakes. Since its launch in spring 2011, OH NOAH! has attracted a strong and growing audience online and introduced new Latino lead characters to children’s media. Emmy Award-nominated OH NOAH! is produced by THIRTEEN for WNET, New York’s flagship public media provider, and funded by the Corporation for Public Broadcasting. WNET is partnering with a variety of organizations to extend the reach of OH NOAH!. Through a new partnership, the national steward organization for “El Día de los Niños,” the National Latino Children’s Institute (NLCI), is helping leverage OH NOAH! content at events in key communities across the country. As part of a partnership with the National Council of La Raza, OH NOAH! will participate in NCLR’s Annual Conference and National Latino Family Expo in Kansas City, July 11-14. According to the Center for Applied Linguistics, benefits of early language learning include improving a child’s understanding of his or her native language, having a positive effect on intellectual growth, enriching and enhancing a child’s mental development and promoting more flexibility in thinking, greater sensitivity to language and a better ear for listening. As the Latino population has increased significantly in the U.S., so has interest in teaching children Spanish. That interest extends to Latino families themselves. According to the Pew Hispanic Center, nearly 65 percent of U.S. Latinos speak only English at home or speak it very well; 95 percent say it is important for their children to know Spanish, too. “Making a Splash,” a new 11-minute video: On a sweltering day, Brisa invites Noah and Nell to go swimming. Noah is hesitant because he can’t swim. 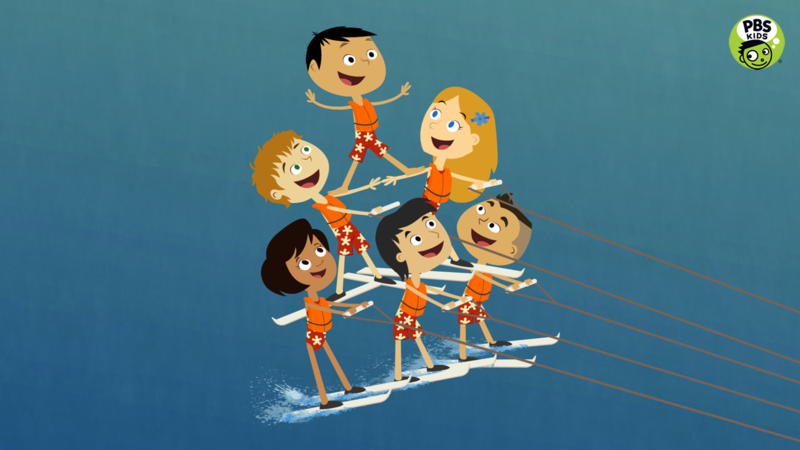 With Nell’s encouragement, Noah decides to get swimming lessons, but because of a misunderstanding, Noah ends up performing tricks with a waterskiing team instead. After the ski team agrees to give him swimming lessons, Noah declares “¡Puedo nadar!” (“I can swim!”) triumphantly. An interactive “Games in Video” version of the “Making a Splash” video that includes embedded language-learning mini-games. New short videos, including an extended version of the music video “Puedo nadar!” (“I can swim!”) and a highlight reel of Pequeño’s funniest moments from the series. "Lost and Found,” a new immersive language-learning game: Players join Noah and Nell on an interactive scavenger hunt. Players seek help from friends and neighbors to decipher Spanish words and locate missing objects, and encounter a series of fun mini-games along the way. OH NOAH! is now mobile-friendly and accessible through smartphones and tablets. Educational resources related to the new video and games are available for students and educators on PBS LearningMedia. In addition, a new printable family activity guide and other activities designed for use by parents and caregivers with their children is available on the OH NOAH! and PBS Parents websites. The OH NOAH! website (pbskids.org/noah) offers 13 three-minute videos with an embedded “Match It” game that helps children learn vocabulary, as well as five other learning games. OH NOAH! videos are also accessible on the free PBS KIDS Video App, which is available on a variety of mobile devices and on platforms such as Roku, Apple TV, Android TV, Amazon Fire TV and Chromecast. Follow OH NOAH! on Facebook and Twitter for news on new content, parent and educator resources, local events and more. As New York’s flagship public media provider and the parent company of THIRTEEN and WLIW21 and operator of NJTV, WNET brings quality arts, education and public affairs programming to more than five million viewers each week. WNET produces and presents such acclaimed PBS series as Nature, Great Performances, American Masters, PBS NewsHour Weekend, Charlie Rose and a range of documentaries, children’s programs, and local news and cultural offerings available on air and online. Pioneers in educational programming, WNET has created such groundbreaking series as Get the Math, Oh Noah! and Cyberchase and provides tools for educators that bring compelling content to life in the classroom and at home. WNET highlights the tri-state’s unique culture and diverse communities through NYC-ARTS, Reel 13, NJTV News with Mary Alice Williams and MetroFocus, the multi-platform news magazine focusing on the New York region. WNET is also a leader in connecting with viewers on emerging platforms, including the THIRTEEN Explore App, where users can stream PBS content for free.